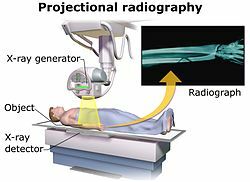 Acquisition of medical projectional radiography, with an X-ray generator and a detector. An X-ray machine is any machine that involves X-rays. It may consist of an X-ray generator and an X-ray detector.